One night in Bangkok.....: The USA Invades Thailand! Roong came up with the idea of visiting a small city in a neighboring province that is basically a little Thailand. It is shaped like the country and has all for major areas represented there. It has little shops and restaurants that give tourists an idea of what each area has to offer. This turned out ok. It was the middle of the week, so it was not crowded, but many of the shops and restaurants weren't open. Still, there were some interesting things to see. We spent a lot of our time trying to dodge tour buses full of noisy students. I am not sure when the last photo of us together was taken. I think Rob said the only existing photo of all 3 of us together is that god awful photo of us as kids, wearing those 60's striped pants and zipper front shirts (Never let your grandma buy clothes for you). This shot was taken somewhere in Lopburi. 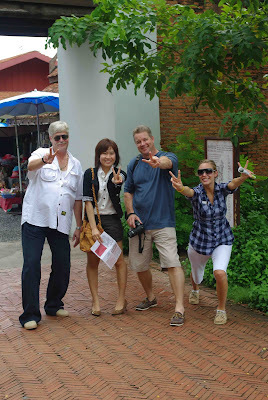 This shot of Roong, Palmiez, and I was taken at the ancient Siam city. They have a few small shrines from the different provinces. Rob said that he had had a knee surgery not too long ago. It was nice to know that I was not the only one creaking as they went to kneel on the floor. The dudes and their daughters. Of course everyone is giving the mandatory little Asian girl peace sign thingy. Soooo creative (NOT!). After we wandered around the village, we headed over to the Hard Rock Cafe, so Rob and lauren could get a few t-shirts and shot glasses. It was only a few minutes away from the hotel that they were staying in according to the map. This did not, however, take in to concideration our fearless mini-van driver. 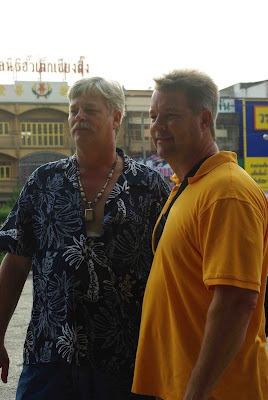 The problem with hiring the guy from our town to drive was that he only knew a few places in Bangkok. Most of which are on the main highway in. He spent most of his time chattering on the phone getting directions. He had to turn around a few times, but all in all, he did ok. Bangkok is huge and the traffic is rugged, there is just no way to get anywhere quickly. Once that was all taken care of, we headed back to Pattananikom. Rob and Lauren stayed at "Bannok". That was nice. The rooms are clean, and the place is friendly. Ead even had breakfast for them the next morning. We sat, had a few beers, and talked for quite a while until jet lag, and the 12 hours we spent riding around in that goofy mini-van slowly won out over us. I don't think anyone had trouble sleeping that night. The next day we met for lunch and just relaxed a bit more. We decided to try and make one more stop before we headed to the airport. Lopburi is kind of on the way, and has some interesting things to see. One of the true highlights of the day was Lauren and the monkeys. This ancient structure is in the center of old Lopburi. There used to be many of these set up all over Thailand. Roong says that they were little Wats, or temples. I imagine they were quite beautiful in their glory days. Now, the monkeys have decided that they own it. 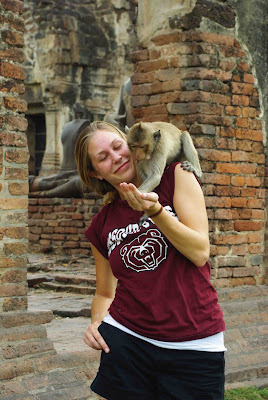 It has been fenced off, but the monkeys still travel wherever they want to in Lopburi. You can buy little bags of sunflower seeds to feed the monkeys, and one of the locals, armed with a slingshot, will help keep them under control. The little buggers will steal anything they can get their hands on. This isn't the best photo of Lauren and the monkeys, but to see that one, you will have to ask her. Haaaa! After this, we headed for the airport. I had not driven to the new airport before, so this was interesting. We made it there on time, only to find out that there United ticket counter was closed, and would not open until the next morning. This meant that Rob and Lauren had to grab a hotel near by for 6 hours or so. Anything near the airport is expensive to the point of being ridiculus. But there was nothing else to do. I was a little worried because Roong and Palmiez were so quiet during all this. They can be shy at times, but both can speak English. They both started to loosen up a bit near the end. They were so worried about being accepted. Everyone seemed to get along just fine. Roong is already planning what to do when they come back. I heard about this for every single second on the 3 hour trip back home. Haaaa! It was great to see family again. I hope that they can come back soon. Next time we can head down to Pattaya and hang out by the beach. Beer and seafood always works. I would like to get up to Chiang Mai to see the mountain villages and the flower festival, but it's 11 hours away. I think they do have an airport though. We will see.